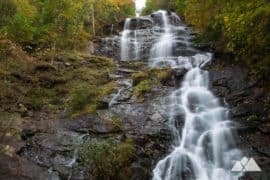 Follow our top ten favorite North Georgia hiking trails to soaring mountain summits, waterfalls and mossy creek valleys in Georgia’s rolling southern Appalachian mountains. 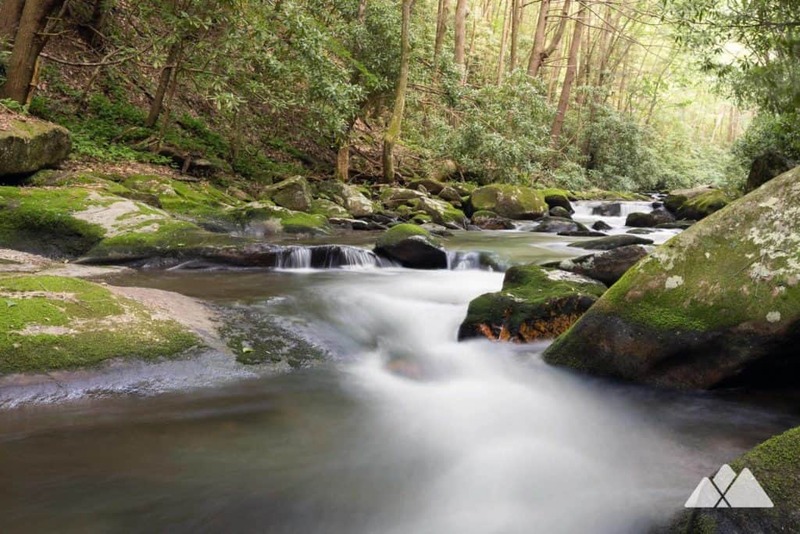 Moss-covered boulders line the cool, rolling waters of a trout stream cutting swiftly through a dense backwoods forest. 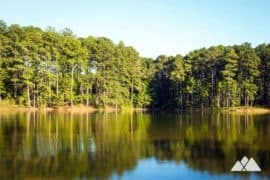 Sunshine streams through the mixed pine and deciduous tree canopy, illuminating a carpet of brilliant green fern below. 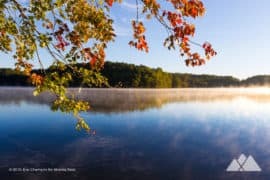 Birds of prey soar in rising uplifts, hugging the rugged peaks of a craggy mountain summit slicing through the horizon. 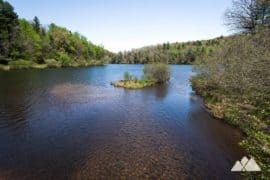 These are the rolling foothills and mountains of the southern Appalachians in North Georgia – and winding through them are a network of fantastic hiking and backpacking trails and outdoor adventures. 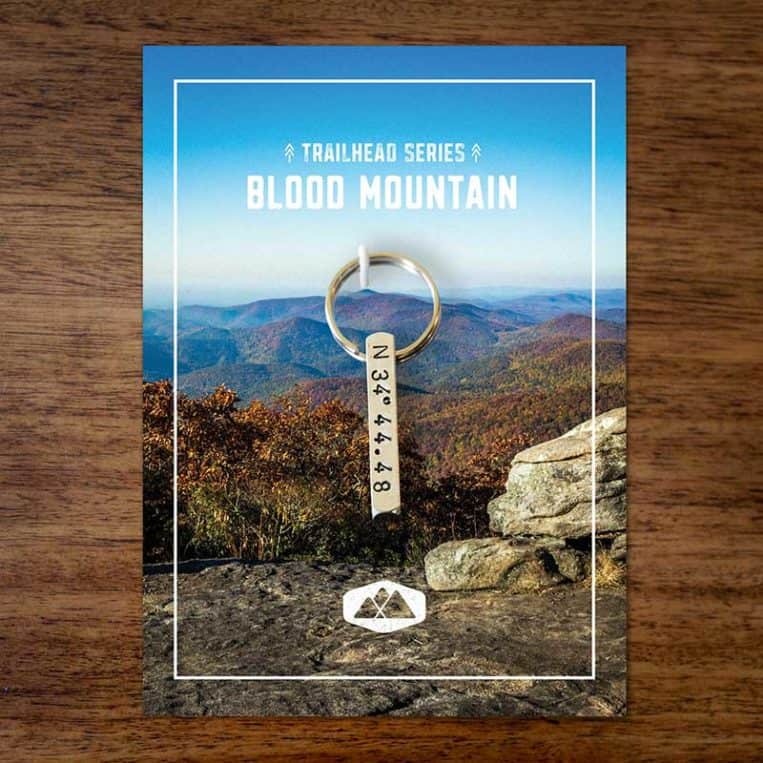 Summit Blood Mountain, the highest-elevation summit on the Appalachian Trail in Georgia, on this three-trail loop hiking up, over and around the summit. 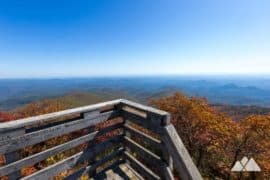 It’s one of the most popular North Georgia hikes – and for a good reason: the views from the summit are outstanding, stretching far and wide over the rolling Blue Ridge Mountains, and it visits a historic Appalachian Trail shelter along the way. 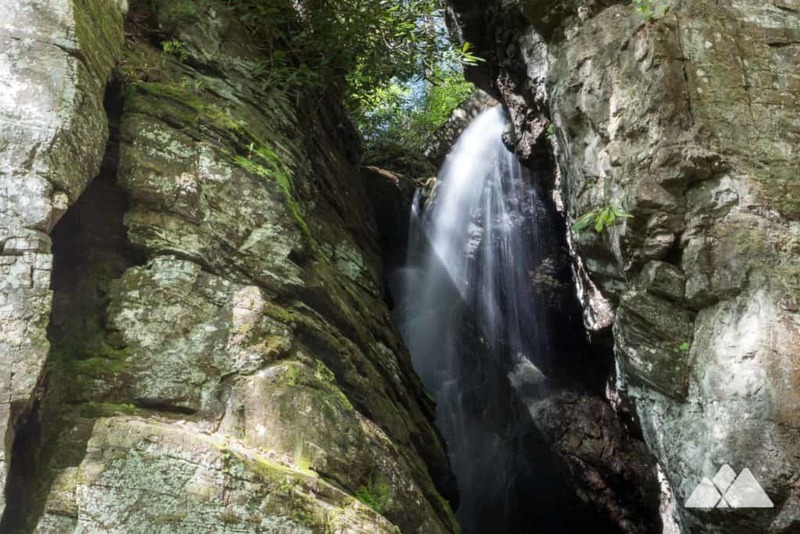 Tallulah Gorge’s towering sheer walls and deep waterfall-filled depths are simply stunning. 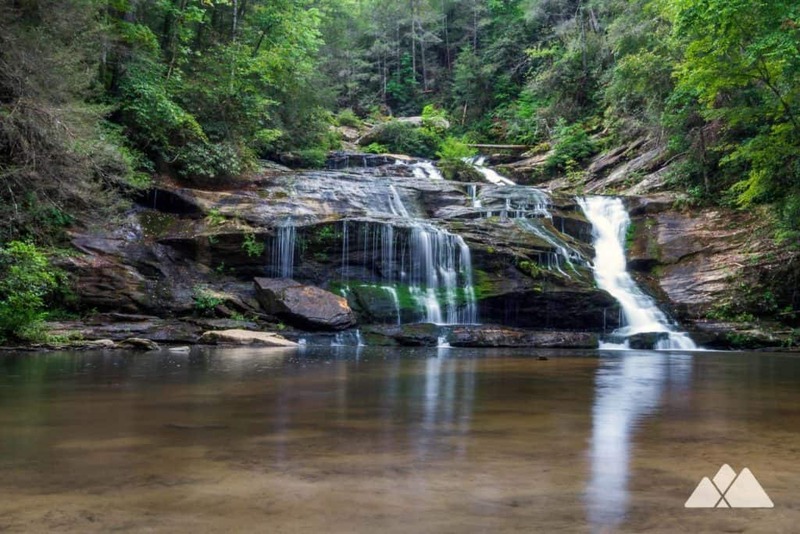 Our favorite hike at Tallulah Gorge State Park catches stunning, soaring views from the gorge’s rim before plunging to the gorge floor by way of a swinging suspension bridge and catching up-close views of the thundering Hurricane Falls. 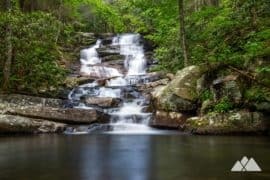 After climbing to the opposite rim, the hike plunges once again, scrambling over boulders to visit the Bridal Veil Falls waterfall, a natural rock slide and the only place swimming is allowed within the gorge. 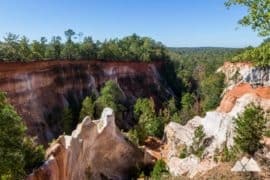 It’s a tough hike, and requires a free permit from the park’s ranger office – but the adventure is oh-so-worth-it. 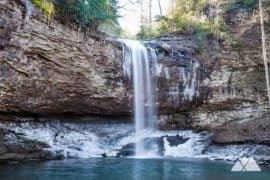 Hike the Raven Cliff Trail through a waterfall-filled valley in the Chattahoochee National Forest to one of Georgia’s most unique waterfalls, Raven Cliff Falls. These gorgeous waterfalls cascade 400 feet down through a towering cliff, slicing the massive cliff in half. 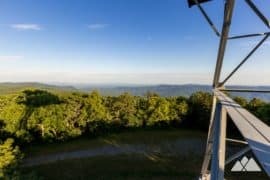 Hike the Appalachian Trail from Woody Gap, exploring a ferny, shady ridgeline at Big Cedar Mountain. 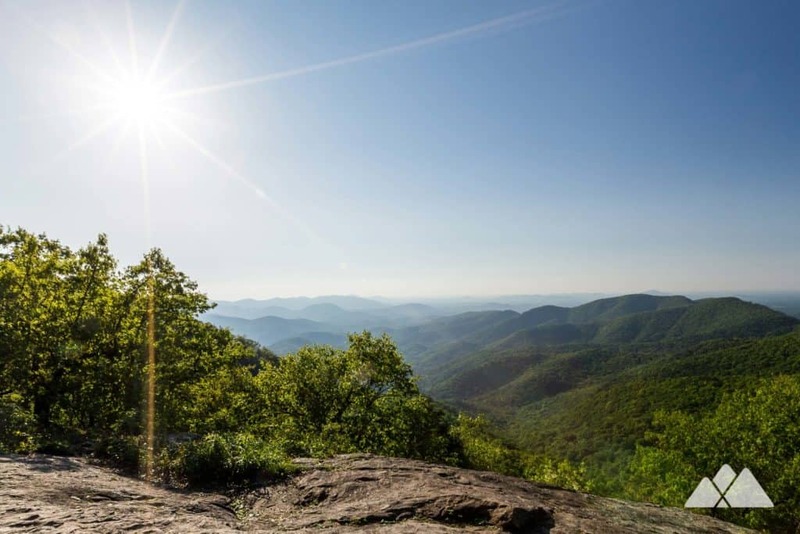 Catch open views from the mountain’s expansive summit at Preacher’s Rock before hiking the AT northbound to Jarrard Gap near Lake Winfield Scott. 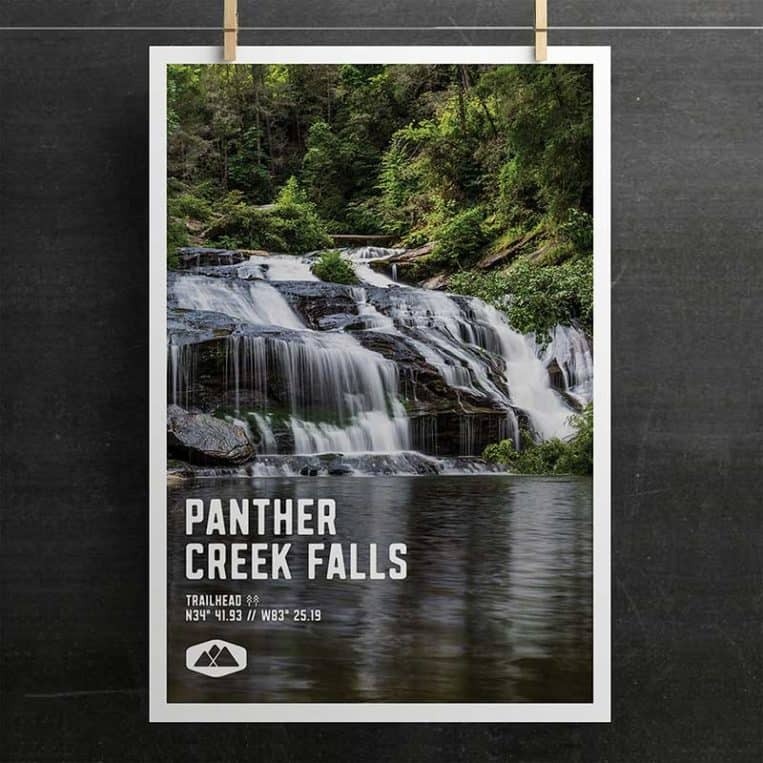 Hike the banks of Panther Creek to one of the most beautiful, rushing waterfalls in Georgia. 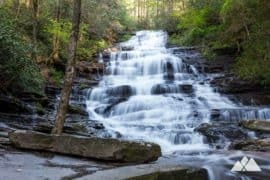 The trail visits the upper, multi-tiered cascades of Panther Creek Falls before dropping to a sandy beach to visit the lower waterfall. 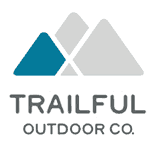 The trail is enormously popular with day hikers, backpackers and campers. 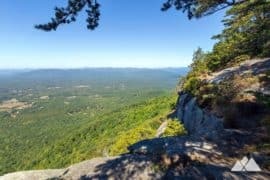 Hike the Appalachian Trail southbound from Three Forks to the southernmost point of the AT in Georgia, Springer Mountain. 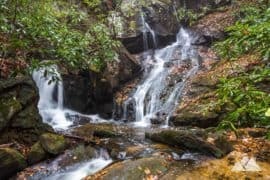 The hike treks from the shady, creek-filled Three Forks valley to the lofty Springer Mountain summit, packing a ton of terrain variety along the hike. 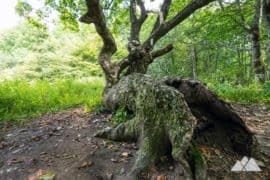 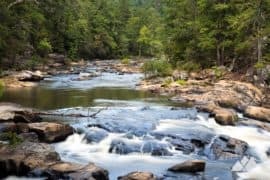 Hike through a remote, lush forest deep in Georgia’s Cohutta Wilderness, following the Conasauga River Trail as it dives through river crossing after river crossing on this fun but challenging hike. 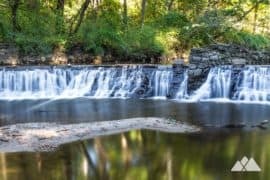 The trail’s namesake river runs nearly crystal-clear, and is home to a staggering variety of freshwater fish. 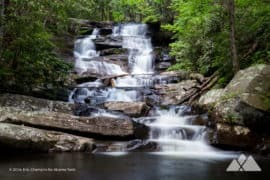 It’s a gorgeous, remote, scenic hike – and a great, splashy, cool hike for Georgia’s scorching summertime months. 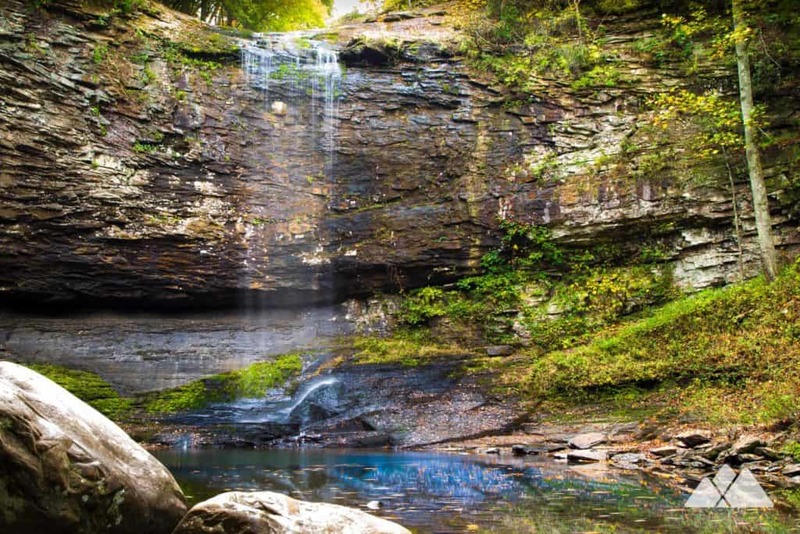 Plunging deep from the rim of Lookout Mountain in northwest Georgia, Cloudland Canyon offers some of the state’s best and most scenic hiking trails. 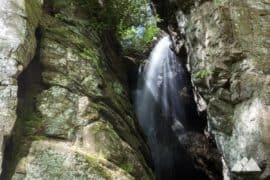 Hike this two-trail duo to visit Cloudland’s duo of plunging waterfalls deep within the canyon, and then follow the West Rim Loop for soaring views from the canyon’s east and west rims. Hike the Yonah Mountain Trail near Helen to outstanding summit views, scaling Yonah’s elevation at a quick pace for a great workout. 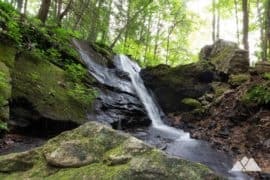 The trail hikes the boulder and wildflower-filled lower elevations of this iconic mountain before cresting at the summit and grabbing incredible views. 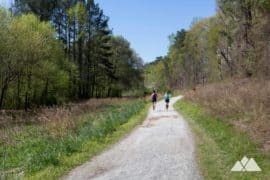 The Appalachian Trail reaches Three Forks in Georgia 4.3 miles from Springer Mountain. 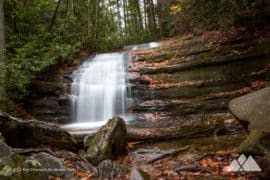 At Three Forks, this classic North Georgia hike starts an Appalachian Trail journey to a beautiful, rushing waterfall in a forest of hemlocks and rhododendrons. 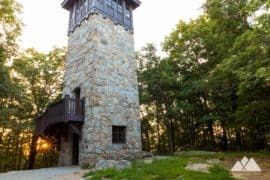 Hike from the shores of the glassy Lake Conasauga, Georgia’s highest-elevation lake, to a historic steel fire lookout tower on the summit of Grassy Mountain. 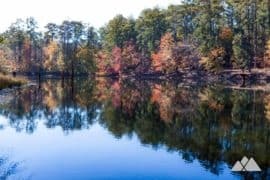 The hike explores scenic forest in Georgia’s remote Cohutta Wilderness, the largest wilderness area east of the Mississippi River, and climbs to incredible views of nearby Fort Mountain. 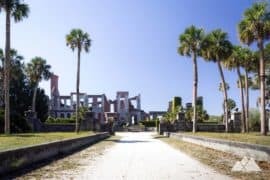 It’s time for a road trip! 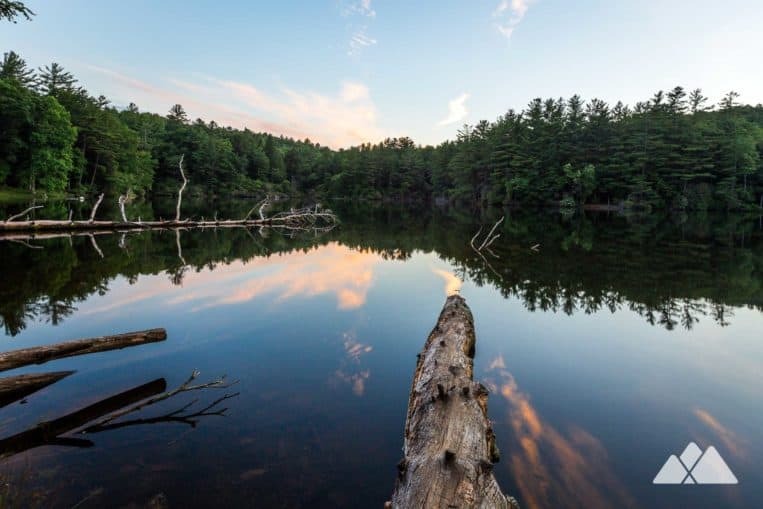 Explore sun-drenched, grassy mountain balds and climb to outstanding overlooks on some of the highest summits on the East Coast. 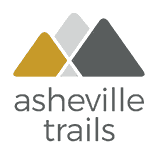 Follow our top ten favorite Asheville trails to stunning views, all within 40 miles of Asheville, NC. 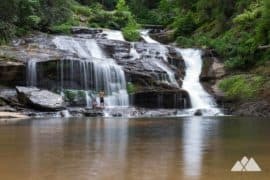 Love waterfalls? 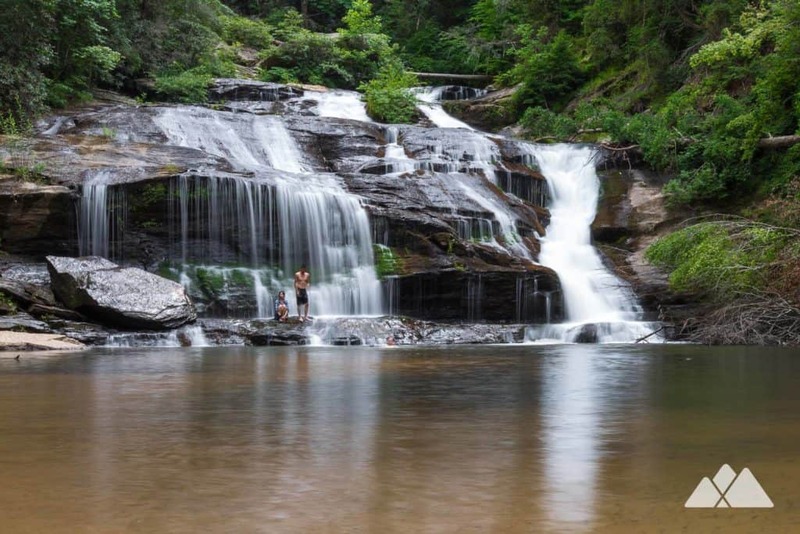 Check out our top ten list of our favorite North Georgia hiking trails to waterfalls. 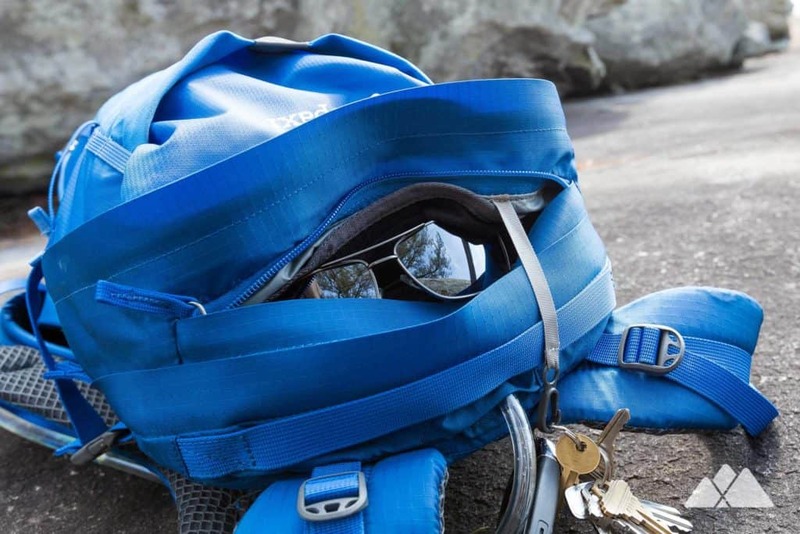 Love mountain summits? Check out our list of our top 25 hikes on Georgia’s highest mountains. 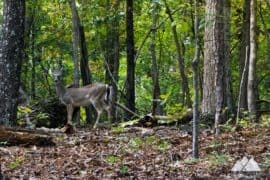 Hiking with a buddy that walks on all fours? 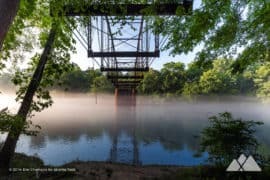 Check out the list of our favorite dog-friendly trails in Georgia, Amber and Jake’s favorite hikes. 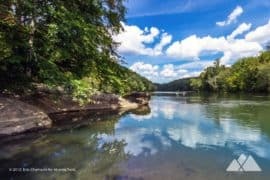 And if you’re up for a road trip, hike to some seriously stunning summit views on our favorite Blue Ridge Parkway hikes near Asheville, NC, climbing to stunning mountaintops over 6,000 feet and exploring plunging waterfalls and crystal-clear swimming holes right off this great American drive. 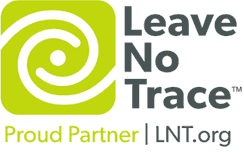 Wherever your adventures take you, please remember to always leave no trace to help preserve the beauty of these wild places. 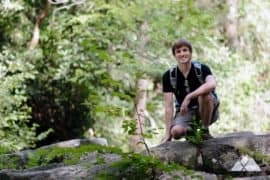 And please follow these tips for good trail etiquette to help make sure everyone has an equally enjoyable time.